When I was a kid, I figured I’d spend my life designing robots. Born and raised in Pittsburgh’s northern suburbs, I fell into the Robotics Institute’s orbit somewhere around my sophomore year in high school. It was an easy choice to stay in Pittsburgh and go to CMU for my undergraduate degree in computer science, then to slip right into the robotics graduate program. I helped to design a bunch of mobile robots for the U.S. Defense Advanced Research Projects Agency (DARPA), the Department of Energy, and a few industrial sponsors, and I assumed I’d make that my life’s work. All of that changed in the spring of 2000. I can’t remember which of my friends and future colleagues reached out first— George Mueller (E’93), Ihor Lys (E’91,’93,’98), Kevin Dowling (S’83, CS’94, ’97), Mike Blackwell (E’86, ’90), Fritz Morgan (E’96), or Colin Piepgras (A’96)—but soon they were all leaning on me to finish grad school and join them in Boston to help build George and Ihor’s startup, Color Kinetics, into a new kind of lighting company. I was dubious at first. Lighting was the most boring “technology” I could imagine, but George and Ihor’s color-changing LED lights were incredibly innovative. By combining red, green, and blue LEDs with networked control, we were able to create an entirely new category of dynamic lighting technology and illuminate buildings and cityscapes all over the world. In hindsight, I was lucky that they made me a part of their story. Color Kinetics helped to set the entire lighting industry on a new solid-state path. We grew quickly, went public in 2004, and were acquired by the Dutch electronics giant Philips in 2007. After the acquisition, I needed a new challenge. Colin and I founded Digital Lumens with a simple goal—to make all lights intelligent—and a core technical team that quickly grew to include Mike and John Wiedey (E’93). Our smart LED light fixtures save a ton of energy, increase worker productivity, and provide a platform for distributed building management. Ironically, if you squint just right, our intelligent lights look a little like a kind of robot. Each light carries a miniaturized computer—with sensors, wireless networking, and software that monitor its environment thousands of times each second. When people walk through a building illuminated with our fixtures, they are actually interacting with hundreds of embedded intelligent “agents” without even knowing it. Each light senses their presence when they pass by, smoothly brightening to full intensity and sharing this sensor data with its neighbors so the lights can react before anyone reaches them. This diffusion of networked intelligence into the real world—the so-called “Internet of things”—will be one of the most interesting technology trends of the next decade. In our case, distributed intelligence helps to reduce our customers’ lighting energy costs by up to 90%. In the United States, 58% of energy used for lighting is consumed by the type of commercial and industrial facilities that use our lights, so the potential environmental impact of widespread adoption of these technologies is enormous. With our products installed in more than 500 customer facilities around the world— lighting more than 50 million square feet of building space while saving more than 250 million kilowatt-hours each year—we are already making great progress. Chemel is the co-founder and chief technology officer of Digital Lumens, a Boston-based developer of intelligent solid-state lighting systems for commercial and industrial facilities. 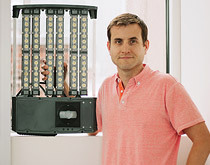 He is pictured with one of the company’s award-winning Intelligent Light Engines. Digital Lumens products have been recognized for their energy efficiency, durability, and intelligent control by the U.S. Department of Energy, the World Economic Forum, the Cleantech Group, and several other organizations.